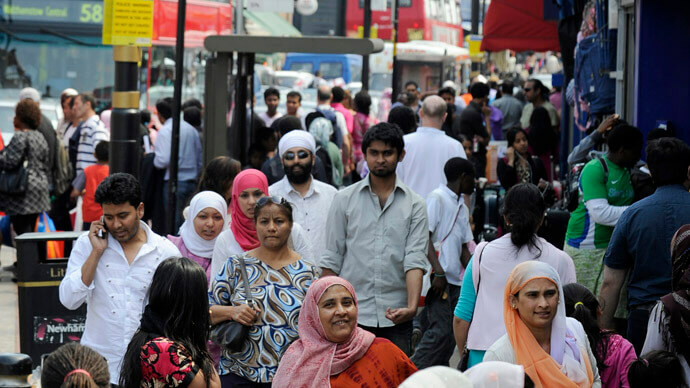 Nearly a third (32%) of black and minority ethnic (BME) Scots have experienced discrimination in the last two years, according to a poll conducted by Survation on behalf of Dr Nasar Meer of the University of Edinburgh. Survation interviewed 508 BME Scots via telephone from 12th June – 17th July 2017. The figures are relatively unchanged from 2015 when the same questions were asked to a similarly-sized sample of BME Scots. In this latest survey, 83% of those who said they had experienced discrimination felt they had experienced it related to their ethnicity, while 44% felt it was related to their religion, almost identical figures to two years ago. Nearly two-fifths (38%) of those who said they had experienced discrimination said they experienced it in getting a job, a third (31%) in being promoted, and a fifth (21%) in getting equal pay, while discrimination was also experienced when accessing public services such as health and education. However, only 14% of those who said they had experienced discrimination reported it to the police, only 16% had made a formal complaint, and 61% said they had not reported it to any higher authority. This is in contrast to the 86% who said they would encourage a friend or family member to make a complaint to the police if they had experienced discrimination. When asked if they thought discrimination was a widespread problem in Scotland, a third (34%) agreed that it was compared to 59% who disagreed. However, 43% thought that other people would perceive discrimination to be a widespread problem in Scotland, indicating that, for some, the perception of discrimination is more problematic. 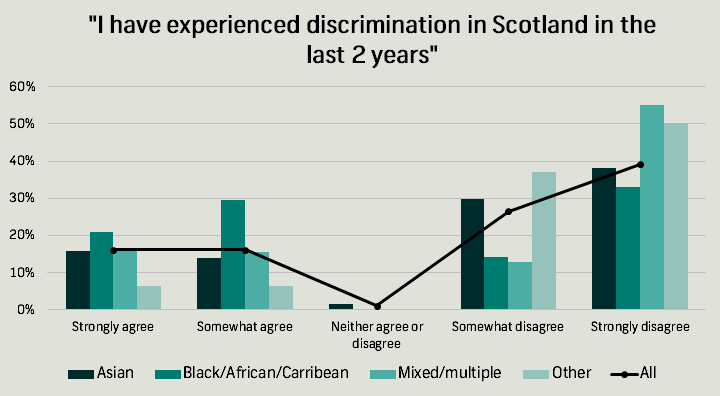 Despite this, a third (34%) felt that incidents of discrimination in Scotland had become more frequent over the last two years, compared to just 13% who thought they’d become less frequent. Just under a half thought that incidents of discrimination had stayed about the same in the last two years. This differs from the survey two years ago, where only 21% of respondents thought that incidents of discrimination had increased, and 22% thought that they’d decreased. Changes from 2015 (in brackets) were also found when respondents were asked which political party is best placed to tackle discrimination in Scotland. In this most recent survey, 34% (-8) thought the SNP is the best political party to tackle discrimination in Scotland, with Labour coming second at 29% (+14). However, there were few differences from 2015 when asked if they felt an independent Scotland would be better placed to tackle discrimination in Scotland; 22% (NC) believed it would be better placed, 21% (+5) believed it would be worse placed, and 45% (-2) believed it would make no difference. Survation interviewed 508 BME Scots via telephone from 12th June – 17th July 2017. Survation is a member of the British Polling Council and abides by its rules.